On Sunday, December 15th the SACC invites you to join us at the corner of Hickory and Goss to decorate the beautiful evergreen planted by Go Green Germantown in 2010. THe tree is next to Mo's food Mart behind the Schnitzelburg sign. Feel free to bring along an ornament, some ribbon, bows, or any decorations you wish to add to the tree! Santa will drop by with some candy and treats. Have you been naughty or nice? After the tree is decorated, we will do some caroling along Hickory Street and make some stops at some brightly lit houses on some side streets. We will also be bringing our holiday cheer to some pubs along the route. 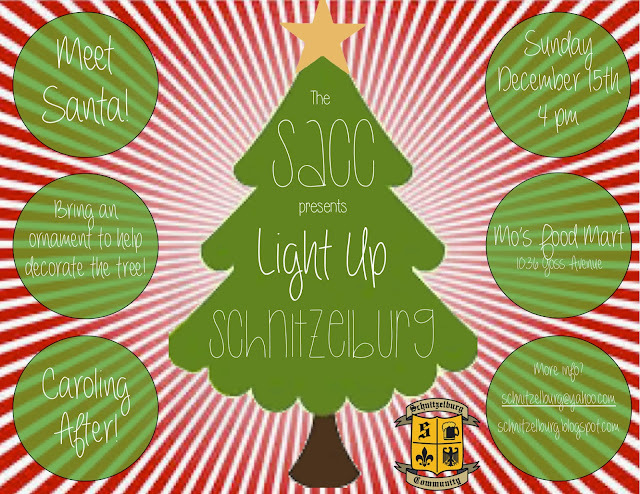 We invite everyone, from one to ninety-two, to come light up Schnitzelburg with some holiday spirit!